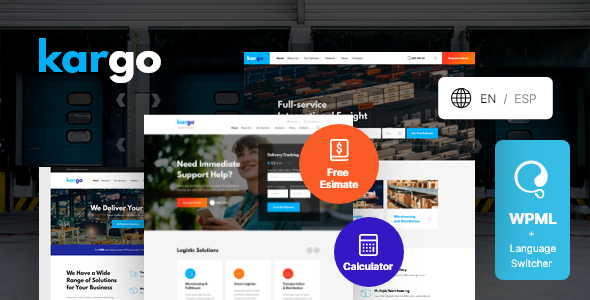 Kargo is a stylish, modern and powerful Logistics WordPress Theme with a high-class bright business design perfect for contemporary trucking agency, transport bureau, logistics firm. Also it fits warehousing, transportation, corporate shipping company, package delivery and freight services. The theme comprises the most useful trendy & versatile features to ensure your logistics organization runs smoothly. Also it is great for businesses related to expedited parcel dispatch, overnight post services, supply chain solutions. Unique layout turns your transportation services website into a real standout with Elementor; quote request form is a great functionality for users to find out the shipping costs and fees. Furthermore the theme is WPML compatible to create multilingual presentations of your business. Kargo features full responsiveness to give your customers a chance to reach you via their mobile devices and many other handy functions and options to create a strong virtual presence for your logistic business!